For other uses, see Subaru (disambiguation). Subaru (スバル) (/ˈsuːbəruː/ or /sʊˈbɑːruː/; Japanese pronunciation: [sɯbaɾɯ]) is the automobile manufacturing division of Japanese transportation conglomerate Subaru Corporation (formerly known as Fuji Heavy Industries), the twenty-second largest automaker by production worldwide in 2012. Subaru cars are known for their use of a boxer engine layout in most vehicles above 1500 cc. The Symmetrical All Wheel Drive drive-train layout was introduced in 1972. The flat/boxer engine and all-wheel-drive became standard equipment for mid-size and smaller cars in most international markets by 1996, and is now standard in most North American market Subaru vehicles. The lone exception is the BRZ, introduced in 2012 via a partnership with Toyota, which uses the boxer engine but instead uses a rear-wheel-drive structure. Subaru also offers turbocharged versions of their passenger cars, such as the Impreza WRX and previously the Legacy GT and Forester XT. In Western markets, the Subaru brand has traditionally been popular among a dedicated core of buyers. Marketing is targeted towards specific niches centered on those who desire the company's signature drive train engine, all-wheel/rough-road capabilities or affordable sports car markets. Subaru is the Japanese name for the Pleiades star cluster M45, or the "Seven Sisters" (one of whom tradition says is invisible – hence only six stars in the Subaru logo), which in turn inspires the logo and alludes to the companies that merged to create FHI. Fuji Heavy Industries started out as the Aircraft Research Laboratory in 1915, headed by Chikuhei Nakajima. In 1932, the company was reorganized as Nakajima Aircraft Company, Ltd and soon became a major manufacturer of aircraft for Japan during World War II. At the end of the Second World War, Nakajima Aircraft was again reorganized, this time as Fuji Sangyo Co, Ltd. In 1946, the company created the Fuji Rabbit, a motor scooter, with spare aircraft parts from the war. In 1950, Fuji Sangyo was divided into 12 smaller corporations according to the Japanese government's 1950 Corporate Credit Rearrangement Act, anti-zaibatsu legislation. Between 1953 and 1955, five of these corporations and a newly formed corporation decided to merge to form Fuji Heavy Industries. These companies were: Fuji Kogyo, a scooter manufacturer; coachbuilders Fuji Jidosha; engine manufacturers Omiya Fuji Kogyo; chassis builders Utsunomiya Sharyo and the Tokyo Fuji Dangyo trading company. Kenji Kita, CEO of Fuji Heavy Industries at the time, wanted the new company to be involved in car manufacturing and soon began plans for building a car with the development code-name P-1. Kita canvassed the company for suggestions about naming the P1, but none of the proposals were appealing enough. In the end he gave the company a Japanese name that he "had been cherishing in his heart": Subaru, which is the Japanese name for the Pleiades star cluster. The first Subaru car was named the Subaru 1500. Only twenty were manufactured owing to multiple supply issues. Subsequently, the company designed and manufactured dozens of vehicles including the 1500 (1954), the tiny air-cooled 360 (1958), the Sambar (1961), and the 1000 (which saw the introduction of the Subaru boxer engine in 1965). Nissan acquired a 20.4% stake in Fuji Heavy Industries, Subaru's parent company, in 1968 during a period of government-ordered merging of the Japanese auto industry in order to improve competitiveness under the administration of Prime Minister Eisaku Sato. Nissan would utilize FHI's bus manufacturing capability and expertise for their Nissan Diesel line of buses. In turn many Subaru vehicles, even today, use parts from the Nissan manufacturing keiretsu. The Subaru automatic transmission, known as the 4EAT, is also used in the first generation Nissan Pathfinder. While under this arrangement with Nissan, Subaru introduced the R-2 (1969), the Rex and the Leone (1971), the BRAT (1978), Alcyone (1985), the Legacy (1989), the Impreza (1993) (and its WRX subtype), and the Forester (1997). Upon Nissan's acquisition by Renault, its stake in FHI was sold to General Motors in 1999. Troy Clarke, of General Motors served as representative to Fuji Heavy Industries on their corporate board. During that time, Subaru introduced the Baja (2003), and the Tribeca (2005). The Subaru Forester was sold as a Chevrolet Forester in India in exchange for the Opel Zafira being sold as a Subaru Traviq in Japan. Also, the Chevrolet Borrego concept was presented in 2002, a crossover coupe/pickup truck being derived from the Japanese-market Legacy Turbo platform. During the brief General Motors period, a badge engineered Impreza was sold in the United States as the Saab 9-2X. An SUV (Subaru Tribeca / Saab 9-6X) was also planned but the Saab version did not proceed, and styling was recycled in the 2008 Tribeca refresh. GM liquidated their holdings in FHI in 2005. Nearly all Saab-Subaru joint projects were dropped at that time, other than Subaru supplying parts for the Saab 9-2x. Toyota Motors bought a little over 40% of GM's former FHI stock, amounting to 8.7% of FHI. (The rest of GM's shares went to a Fuji stock buy-back program.) Toyota and Subaru have since collaborated on a number of projects, among them building the Toyota Camry in Subaru's Indiana U.S. plant beginning in April 2007. Subaru introduced the Exiga in 2008. Toyota increased their share of FHI to 16.5% in July 2008. Subsequently, Toyota and Subaru jointly developed the Toyota 86, first sold in January 2012 as the Subaru BRZ and by Toyota under various names. Some of the advertising slogans Subaru has used in the past include: "Inexpensive, and built to stay that way" (USA 1970s – early 1980s), "The World's Favourite Four Wheel Drive" (in the UK), "Plus on y pense, plus on a le gout de la conduire" (Literally: "The more one thinks, the more one has the taste (or desire, impulse, drive) of driving it") in French Quebec, "We built our reputation by building a better car", "What to Drive", "The Beauty of All-Wheel Drive", "Driven by What's Inside", "Think, Feel, Drive", "Love. It's what makes Subaru, a Subaru" (USA early 2010s) and currently "Confidence in Motion" in North America, "All 4 The Driver" in Australia, "Uncommon Engineering, Uncommon Stability, Uncommon Roadholding, Uncommon Sense" in the UK and "Technology that gives you Confidence in Motion" in Southeast Asia. In the 1990s, an ad firm hired by Subaru found the all wheel drive cars were popular among lesbians. The company started including subtle marketing to this demographic. According to Automotive Lease Guide, Subaru ranked second place in vehicles that have the highest overall predicted resale values among all industry and all luxury vehicles for MY 2009. The awards are derived after carefully studying segment competition, historical vehicle performance and industry trends. According to a study done by J.D. Power and Associates for the 2008 Customer Retention Study, Subaru ranked at 50.5%, which was above the national average of 48%. Subaru launched an animation series Wish Upon the Pleiades Hōkago no Pleiades (放課後のプレアデス, Hōkago no Pureadesu, lit. 'After School Pleiades') developed jointly with Gainax. The 4-part mini episode series was released on YouTube on February 1, 2011. It featured a magical girl plot with Subaru as a leading protagonist. Subaru's corporate headquarters are located in Ebisu, Tokyo. Subaru is distinct from many of its Japanese competitors in that as of early 2016 it still made almost 75% of its cars sold internationally in Japan. Subaru's facilities designated to automotive manufacturing are located in Ōta, Gunma Prefecture, consisting of four locations. Subaru-chō is where the Subaru BRZ/Toyota 86 is built, having been re-purposed from kei car production, Yajima Plant is where all current Subaru cars are built, Otakita Plant is where commercial kei trucks are built (originally a factory location of Nakajima Aircraft Company), and Oizumi Plant in Oizumi, Gunma Prefecture, is where engines and transmissions are built. Subaru's only overseas manufacturing facility is located in Lafayette, Indiana; the factory is called Subaru of Indiana Automotive, Inc.. Due to continued sales growth in North American markets, vehicle production capacity at the Lafayette assembly plant is set to expand to 390,000 vehicles annually. Under the current strategic plan, Subaru will have a total production capacity of 1,026,000 vehicles per year at the end of 2016. In 1976, Canadians got their first exposure to Subaru vehicles when Subaru Auto Canada Limited (SACL) began offering the Subaru Leone. In 1989, the privately owned SACL was purchased by the Toronto-based Subaru Canada, Inc. who, under the guidance of parent company Fuji Heavy Industries, began an expansion process that would eventually see over 100 Subaru Dealers in operation across the country. Subaru Canada, Inc. is a wholly owned subsidiary of Fuji Heavy Industries of Japan. Headquartered in Mississauga, Ontario, the company markets and distributes Subaru vehicles, parts and accessories through a network of 88 authorized dealers throughout Canada. In Asian countries outside of Japan, Subaru vehicles, parts and accessories are supplied by Motor Image Group, a wholly owned subsidiary of Hong Kong-based Tan Chong International Limited under businessman Glenn Tan. Subaru has entered the Philippine operations started in 1996 under the Columbian Motors Philippines ownership but withdrew in 2000. It returned in 2006 under a new ownership by Motor Image Pilipinas, Inc. Subaru has eleven dealerships in the country: Greenhills, Fort Bonifacio, Manila Bay, Alabang, Davao, Cebu, Cagayan de Oro, Iloilo, Santa Rosa, Batangas, and Pampanga. Subaru once had a presence in South Korea, established in 2009 in Yongsan, Seoul under Choi Seung-dal. Sales started in April 2010 with the Legacy, Outback and Forester as the initial lineup for the South Korean market. They were the fifth Japanese automobile manufacturer to enter after Toyota, Honda, Nissan and Mitsubishi. According to the company, they delayed their entry due to market dominance by Hyundai and Kia. By 2012, Subaru Korea announced that they would discontinue selling 2013 car models due to low sales. In 1974 Robert Edmiston was finance director at sports car manufacturer Jensen Motors. When the company went bankrupt, he used a £6,000 redundancy payout to set up International Motors, which acquired the UK franchise for Subaru and Isuzu. The Coleshill based company is still the parent for Subaru in the UK. Subaru of America was established in 1968 in Philadelphia, Pennsylvania by Malcolm Bricklin and Harvey Lamm. It relocated to Pennsauken, New Jersey shortly thereafter and moved to its current headquarters in Cherry Hill, New Jersey when Fuji Heavy Industries acquired full ownership. Subaru of America operates regional offices, zone offices and parts distribution centers throughout the United States. Subaru of America also operates port facilities on both the West and East coasts. In 1989 Subaru and then-partner Isuzu opened a joint factory in Lafayette, Indiana called Subaru-Isuzu Automotive, or SIA, which initially manufactured the Subaru Legacy and Isuzu Rodeo. In 2001 Isuzu sold their stake in the plant to FHI for $1 due to flagging sales and it was renamed Subaru of Indiana Automotive, Inc. SIA has been designated a backyard wildlife habitat by the National Wildlife Federation and has achieved a zero-landfill production designation (the first automotive assembly plant in the United States to earn that designation). According to the Kelley Blue Book in 2015, two Subaru models Forester and the Outback in the United States had very short inventory time (the time between being received by a dealer to being sold). Subaru Rally Team Japan led by Noriyuki Koseki (founder of Subaru Tecnica International, STI) ran Subaru Leone coupé, sedan DL, RX (SRX) and RX Turbo in the World Rally Championship between 1980 and 1989. Drivers for individual rallies included Ari Vatanen, Per Eklund, Shekhar Mehta, Mike Kirkland, Possum Bourne and Harald Demut. Mike Kirkland finished 6th overall and won the A Group at the 1986 Safari Rally. That year Subaru was one of the only manufacturers combining 4WD and turbo after Audi's successful quattro system had been introduced in 1980, but Audi withdrew from the WRC after safety concerns and Ford's serious accident early in the 1986 season. Subaru changed the rally model to Legacy RS for the 1990–1992 period and took part in the first complete season in the World Rally Championship with the same model in 1993. Modified versions of the Impreza WRX and WRX STi have been competing successfully in rallying. Drivers Colin McRae (1995), Richard Burns (2001) and Petter Solberg (2003) have won World Rally Championship drivers' titles with the Subaru World Rally Team and Subaru took the manufacturers' title three years in a row from 1995 to 1997. Subaru's World Rally Championship cars are prepared and run by Prodrive, the highly successful British motorsport team. Several endurance records were set in the early and mid-nineties by the Subaru Legacy. The Subaru Justy also holds the world record for the fastest sub 1.0L car without a turbo: 123.224 mph average, it was set in 1989. On 16 December 2008, it was announced that Subaru would no longer be competing in the World Rally Championships. The decision was made by Subaru’s parent company, Fuji Heavy Industries (FHI), partly as a result of the economic downturn but also because it was felt Subaru had achieved its sporting and marketing objectives. Mr Ikuo Mori denied that alterations to the WRC technical regulations in 2010 or a rumored deterioration in the working relationship with Prodrive had any impact on the decision. He also said that the possibility of a Subaru car back in the top category of WRC in the future is not zero, but for this moment there can be no assumption of a comeback. Since 2005, Cusco Racing have entered an Impreza and a BRZ in the Super GT championship. In 2008, the Impreza was the first 4-door and first 4WD vehicle to win a race. Starting in 2006, Subaru of America (SOA), as the official distributor of Subaru vehicles in the United States participates in the Subaru Road Racing Team (SRRT) with a Subaru Legacy 2.5 GT Spec-B in the Grand-Am Street Tuner class. In 2010, SRRT campaigns a Subaru Impreza WRX STI in the Grand Sport class. In 2011, SRRT switched from the hatchback to a 2011 Subaru Impreza WRX STI sedan. On 4 May 2012, Subaru Rally Team USA announced that a new rallycross team, Subaru Puma Rallycross Team USA, will participate in the 2012 Global RallyCross Championship season with Dave Mirra, Bucky Lasek, and Sverre Isachsen. They also competed in the 2014 FIA World Rallycross Championship. The Impreza has won hillclimbs such as the Silverstone Race to the Sky and Mount Washington Hillclimb Auto Race. The 2007 Frankfurt International Motor Show saw Subaru introduce a horizontally opposed, water-cooled, common rail turbodiesel using a variable geometry turbocharger called the Subaru EE engine, the first of its type to be fitted to a passenger car. Volkswagen had experimented with this idea during the 1950s and made two air-cooled boxer prototype diesel engines that were not turbocharged. VW installed one engine in a Type 1 and another in a Type 2. The Subaru engine was rated at 110 kW (150 PS; 148 hp) and 350 N⋅m (260 ft⋅lbf) with a displacement of 2.0 liters. In March 2008 Subaru offered the Legacy Sedan and Wagon and the Outback Wagon with 2.0 liter turbodiesel in the EU with a 5-speed manual transmission. In September 2008 Subaru announced that the diesel Forester and diesel Impreza will be introduced at the 2008 Paris Motor Show, with Forester sales to begin October 2008 and diesel Impreza sales to start January 2009. The Forester and Impreza will have a 6-speed manual transmission, whereas the Legacy and Outback have 5-speed manual transmissions. In June 2006, Fuji Heavy Industries, Inc. (FHI) launched its Subaru Stella Plug-in electric vehicle which is a kei car equipped with a lithium-ion battery pack. The vehicle has a short range of 56 miles (90 km) but it actually costs more than the Mitsubishi iMiEV, at ¥4,380,000 (US$44,860), including Japanese Government consumption taxes with an exemption of $2,240. It also qualifed for a rebate from the Japanese Government of up to $14,200, bringing the price down to $30,660. The vehicle is much like the i-MiEV, with a 47-kilowatt motor and a quick-charge capability, but the two-door mini-car has a boxy shape. FHI set a goal of selling 170 vehicles by March 2010. In Japan, Subaru is currently testing two electric vehicles called the Subaru G4e and the Subaru R1e. The Subaru Hybrid Tourer Concept is a four-seat vehicle with gull-wing doors that combines a 2-liter turbocharged direct-injection gasoline engine with a continuously variable transmission and two axle-mounted motors. A lithium-ion battery pack provides energy storage for the vehicle. In early 2018, Subaru, along with Suzuki, Daihatsu and Hino Motors, joined the nascent EV C.A. Spirit venture to collaborate on electric vehicle technology development. The project was launched by Toyota, Mazda and automotive component manufacturer Denso in September 2017. Subaru was among the few makes lacking any electric models. In the U.S., the short-lived Crosstrek hybrid was on the market only for the 2014 to 2017 model years. In 2018, for the 2019 model year, Subaru unveiled the 2019 model year Crosstrek Plug Hybrid, based in large part on technology from shareholder Toyota's Prius Prime platform. The EV range is 27 km (17 mi). It is only available in California and parts of the East Coast. A full EV is in the works and promised in 2020, for 2021 model year. Since the 2005 model year, Subaru has adopted the CAN bus technology for the USA and Canada markets. Starting in the 2007 model year, all Subaru vehicles use the CAN technology. Typically, two CAN-buses are used on vehicles: a high-speed CAN running at 500 kbit/s for powertrain communication, and a low-speed CAN running at 125 kbit/s for body control functions and instrument panels. A body-integrated unit (BIU) is used between these two networks. In 2008, Subaru introduced their EyeSight driver assistance and safety system. Unlike most such systems, which use radar or sonar sensors, EyeSight uses dual video cameras mounted at the top of the windshield. Depth information is derived from the parallax between two video signals and used to judge the distance to the next vehicle for features such as pre-collision braking and adaptive cruise control. The company has continued to improve the technology, which now includes lane-keeping assistance. EyeSight is now available on most Subaru models (usually in higher trim levels) and is standard on the Subaru Ascent. Subaru debuted its new chassis design, dubbed the Subaru Global Platform, with the release of the 2017 Impreza. Having spent over a billion dollars on research and development the company plans to extend the architecture to all of its other models, with the exception of the BRZ which is co-developed with Toyota. By incorporating high-strength steel into the chassis updated vehicles will have stiffer bodies that increase safety through greater impact absorption while also improving ride comfort. Another focus of the new platform is modularity, allowing Subaru to reduce development costs by streamlining production throughout its network of facilities. The platform will be able to accommodate a variety of powertrains, including gasoline, hybrid, and fully electric designs. Subaru claims to have implemented advanced policies which include recycling, reducing harmful emissions, and educating their employees. Their efforts have helped them in their environmental initiatives. The Subaru plant in Lafayette, Indiana (SIA) was the first auto assembly plant to achieve zero landfill status; nothing from the manufacturing process goes into a landfill. The company has developed a recycling plan for the "end-of-life" of their cars. Most of their modern products use highly recyclable materials throughout the vehicle, in the engine, transmission, suspension and elsewhere in each vehicle leaving Subaru with a 97.3% recycling ratio rate for their end-of-life vehicles. An excerpt from the Subaru website stated "In 2006, SIA was awarded the United States Environmental Protection Agency´s Gold Achievement Award as a top achiever in the agency's WasteWise program to reduce waste and improve recycling." The website also stated that "It also became the first U.S. automotive assembly plant to be designated a wildlife habitat." Subaru currently offers a Partial Zero Emissions Vehicle (PZEV) certified Legacy, Outback, Impreza, XV/Crosstrek and Forester models which are available for sale anywhere in the U.S. Subaru PZEV vehicles meet California's Super-Ultra-Low-Emission Vehicle exhaust emission standard. All other models have been certified LEV2. Subaru has partnered with various manufacturers over time – here are some of the models sold in Asia and Europe. In Japan they are in the Kei car class with either front or all wheel drive and a straight engine. An article posted by Autoblog on April 16, 2008 stated that due to a corporate investment by Toyota, all Kei cars built by Subaru will be replaced by Daihatsu models beginning in 2010. ^ "Corporate Profile | Subaru Outline". SUBARU. Retrieved 2018-03-18. ^ "Corporate Information | Overview". Fuji Heavy Industries Ltd. 2015-03-31. Retrieved 2016-02-16. ^ "Annual Report 2017 Five-Year Automobile Sales" (PDF). Japan: Subaru. 2017-03-31. Retrieved 2018-07-07. ^ a b c d e "Annual Report 2017 Consolidated Balance Sheets" (PDF). Japan: Subaru. 2017-03-31. Retrieved 2018-07-07. ^ "Subaru UK Boxer Diesel TV Ad". 2009-06-15. ^ "Subaru Impreza 22B STI: The Original Rally Icon! – Ignition Episode Ep. 98". 2014-01-06. ^ "Japanese pronunciation of Car Brand". ^ "World Motor Vehicle Production, Year 2012" (PDF). OICA. Retrieved 2013-11-02. ^ Jie, Ma; Hagiwara, Yuki (2013-08-09). "Subaru's 412% Surge Leads Carmaker to Debate Niche Status". Bloomberg Business. Retrieved 2015-11-25. ^ "Origins of Subaru name". Subaru-global.com. Archived from the original on 2010-04-11. Retrieved 2010-10-05. ^ "Fuji Rabbit.com". Fuji Rabbit.com. Archived from the original on 2008-12-11. Retrieved 2010-10-05. ^ "Subaru Heritage". Subaru Global. Subaru Corporation. Retrieved 2017-04-10. ^ "Inspiration of naming first Subaru vehicle". Subaru Global. Archived from the original on 2013-07-31. Retrieved 2010-10-05. ^ "Saab 9-6X Gets the Go-ahead". edmunds.com/insideline. Retrieved 2007-07-28. ^ "Subaru plans new model revolution". autocar.co.uk/News. Retrieved 2007-07-28. ^ "Saab Developing Smaller Crossover After Collapse of Subaru Alliance". edmunds.com. Retrieved 2007-07-28. ^ a b "GM sells Subaru stake to Toyota". AutoBlog. 2005-10-05. Retrieved 2016-02-27. ^ "Subaru to stop building Camrys for Toyota in Indiana, reports say". Automotive News. 2013-11-14. Retrieved 2016-02-27. ^ "Update: Toyota nearly doubles stake in Subaru parent FHI". MotorAuthority. 2008-06-27. Retrieved 2016-02-27. ^ Korzeniewski, Jeremy (2008-04-25). "''What really makes a Subaru a Subaru? Love?''". AutoBlog.com. Retrieved 2010-10-05. ^ "When Subaru Came Out". National Public Radio. US. 2016-10-14. Retrieved 2018-07-07. ^ Mayyasi, Alex (2016-05-23). "How an Ad Campaign Made Lesbians Fall in Love with Subaru". Priceonomics. US. Retrieved 2018-07-06. ^ "Automotive Lease Guide announcement for MY 2009". ALG. US. 2008-11-20. Archived from the original on 2011-07-07. ^ "2008 Customer Retention Study | J.D. Power and Associates". Jdpower.com. 2008-12-10. Retrieved 2009-06-12. ^ Wilson, Thomas (2015-07-28). "Subaru's secret: Marginalized foreign workers power a Japanese export boom". Reuters. Retrieved 2016-08-28. ^ "Facilities | Domestic facilities". Japan: Fuji Heavy Industries. Retrieved 2016-12-16. ^ "2015 Annual Report" (PDF). Fuji Heavy Industries. 2015-06-24. p. 23. Retrieved 2016-08-29. ^ "Subaru – About Us > News and Events" (Press release). Motor Image, Philippines. 2009-01-26. Retrieved 2014-03-31. ^ "Motor Image PH to open 4 new Subaru dealerships in 2013". Top Gear Philippines. 2012-12-08. Retrieved 2014-03-31. ^ "Terms and Conditions | Latest Outback offers". UK: Subaru. Retrieved 2016-12-16. ^ a b "Subaru's company history, policies, attitudes, viewpoints, and basic info". Subaru of America, Inc. Retrieved 2014-02-12. ^ McIntyre, Douglas (2016-04-30). "Subaru outsells itself". 247wallstreet. US. Retrieved 2016-05-01. ^ "David Higgins Wins 2011 Rally America National Championship". US: Vermont Sports Car. 2011-07-18. Retrieved 2012-05-21. ^ "Subaru pull out of World Rallying". Japan Times. 2008-12-16. ^ "Subaru doesn't rule out WRC return". WRC. 2008-12-16. Archived from the original on 2013-09-30. Retrieved 2013-10-06. ^ "Subaru Impreza WRX STI SRRT racecars". Carsession.com. US. 2010-02-01. Retrieved 2010-10-05. ^ "Drivers & Teams". Global Rally Cross. Retrieved 2013-10-06. ^ Elfalan, Jonathan (2011-07-13). "Isle of Madness – 2011 Isle of Man Subaru Record Breaking Run". Road and Track. US. Retrieved 2016-10-20. ^ Burt, Matt (2016-06-28). "New onboard video: Subaru's record-breaking Isle of Man TT lap". Autocar. US. Retrieved 2016-10-20. ^ "The Diesel Beetle". ltv-vwc.org.uk. Retrieved 2008-04-03. ^ "Geneva Motor Show: Subaru diesel boxer engine". autobloggreen.com. Retrieved 2007-08-01. ^ "Subaru's 2.0L Turbodiesel Boxer – 110kW/147hp". ^ Neff, John (2008-09-05). "Euro-spec Impreza diesel introduction". Autoblog.com. Retrieved 2010-10-05. ^ "Subaru Boxer Turbodiesel – Specifications – First Drive – Truck Trend". trucktrend.com. Retrieved 2008-03-05. ^ "EERE News: Mitsubishi and Subaru Launch Electric Cars in Japan". US Department of Energy. 2009-06-10. Retrieved 2012-08-04. ^ "EERE News: Honda CR-Z Concept Hybrid Debuts at the Tokyo Motor Show". US Department of Energy. 2009-10-29. Retrieved 2012-08-04. ^ "Suzuki, Hino, Subaru and Daihatsu Join Toyota-Led EV Project - World Industrial Reporter". World Industrial Reporter. 2018-01-02. Retrieved 2018-08-18. ^ Edelstein, Stephen. "Subaru Crosstrek Hybrid discontinued for 2017 model year". Green Car Reports. Retrieved 2018-08-18. ^ "2019 Subaru Crosstrek - Hybrid". US: Subaru. Retrieved 2019-02-16. ^ Greimel, Hans; Okamura, Naoto. "To electrify, Subaru leans on its friends". autoweek.com. Automotive News. Retrieved 2018-08-18. ^ "Clarion Japan | Business Outline". www.clarion.com. Retrieved 2016-02-28. ^ "Clarion Brings Aftermarket Technology To Subaru". www.twice.com. Retrieved 2016-02-28. ^ "Clarion U.S.A | Subaru Launches the Next Generation of its STARLINK Infotainment System Utilizing Clarion's Smart Access Connectivity Platform". www.clarion.com. Retrieved 2016-02-28. ^ Insurance, Liberty Mutual. "Liberty Mutual Insurance and Subaru Introduce New Technology to Promote Safe Driving and Savings on Auto Insurance". www.prnewswire.com. Retrieved 2016-02-28. ^ "Harman Kardon Automotive Subaru". www.harmankardon.com. Retrieved 2016-02-28. ^ Lyon, Peter. "Subaru's New Impreza Cost $1B -- Was It Worth It?". Forbes. Retrieved 2018-07-09. ^ "Subaru Global Platform Debuts, Will Underpin All Future Subarus". Car and Driver. Retrieved 2018-07-09. ^ a b "Subaru's environmental record". Subaru.com. Retrieved 2010-10-05. ^ "Fuji Heavy Industries Ltd. > CSR / Environment > Environmental Report ｜Automobile Recycling". Fhi.co.jp. 2005-01-01. Retrieved 2012-01-14. ^ "2012 Subaru Impreza Sedan 2.0i PZEV Price With Options". Edmunds.com. Retrieved 2012-01-14. ^ "2016 Subaru Crosstrek Models & Specs – Crossover". Retrieved 2016-02-03. ^ "It's What Makes a Subaru, a Subaru: Controlling Emissions – Part Two". Drive2.subaru.com. Archived from the original on 2012-04-25. Retrieved 2012-01-14. ^ Gardiner, Justin (2008-04-16). "Subaru to stop making Kei Cars". Autoblog. Retrieved 2010-10-05. ^ Manning, Steve (1999). "1996 Subaru Exiga station wagon (concept car)". The Online Home of the Station Wagon. US. Retrieved 2016-10-18. ^ "Subaru B11S". Diseno-Art. 2014. Retrieved 2016-10-18. ^ "Subaru to make bikes?". Faster and Faster. 2007-12-04. Retrieved 2016-10-18. 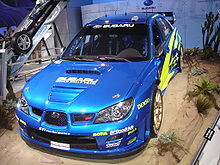 Wikimedia Commons has media related to Subaru vehicles.